Most of the trails below are closed due to the 2018 eruption. Check the link for status on the Volcano section of the Activities page. Volcano is about two and a half hours from the Ranch. It is a pleasant drive. Although it can be done in a day, we recommend visiting South Point on the way and overnighting in Volcano or Naalehu. The road from Kona winds past the scenic Captain Cook and down through barren lava and ohia forest areas and onto the scenic town of Naalehu (about one hour from Volcano). Musts in Volcano are the Visitors' Center; Thurston Lava Tube; Kilauea Iki trail; Steam Vents; and Chain of Craters road. 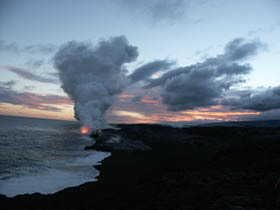 A good web site for Volcano information is Hawaii Volcanoes National Park. Thurston Lava Tube off of Crater Rim Road is a tunnel created by lava flow; the main part is lit. It is a short and well-lighted hike. Walk counter clockwise, and you can hike an extension of the tube which is not lighted. The extension is about 100 -150 meters in length and is an easy hike. Note that in the extension, because the lava does not have much reflectivity and absorbs the light, the flashlight may look a little dim. Bring either extra batteries or two lights so that you don't get stuck in the dark. Kilauea Iki Trail is an easy 4 mile hike down into the crater. Start at the Kilauea Iki Overlook on Crater Rim Drive. The hike goes down through a rain forest with giant ferns. Walking on the crater feels like walking on the moon. Allow an hour and a half to two hours. Be sure to go counter clockwise for a better perspectives and views. You can do it in sandals. Halema'uma'u Overlook on Crater Rim Drive has lots of steam vents. Hike out a hundred yards or so for an excellent view of the Halemaumau Crater. Chain of Craters Road winds down to the ocean. If the lava is flowing into the ocean you can see tremendous steam clouds rising out of the water. 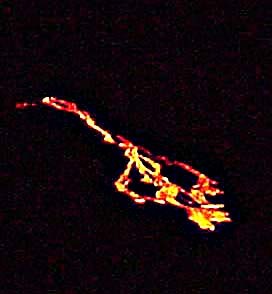 At night, if the lava breaks through the surface, you can see it flowing down the slope. Check in with the visitor center to see if this is happening as it is infrequent. The flow is approximately 4 miles from the end of the road. It is not safe to hike close to the lava flow. We watched it break through the surface (picture above) and it was spectacular. Bring binoculars (Silver Oaks has them). Even without the lava, the night sky is impressive in its own right. Mauna Ulu off of Chain of Craters Road is a good short hike and best done at twilight when you can see the glow from Pu'u 'O'o. This is also a good BIRDING area. Devastation Trail just down from Thurston Lava Tube on Crater Rim Drive is a nice short hike of a half mile out and a half mile back. Kilauea Iki erupted in 1959 spewing ash over this area and causing evacuation of the park. The area is just starting to come back. On a clear day, if you hike up to the top of the two hills midway down the path (in the picture below), you have spectacular views of Mauna Loa, Mauna Kea and Kilaua Caldera with it craters Halema'uma'u and Kiluaea Iki. The hike is about 10 minutes and is not difficult.